For too long, the chicken has languished at the bottom of the avian intelligence pecking order. No longer! According to researchers, the hen, far from being a bird brain, is actually an egghead with a capacity for mathematical reasoning, an ability to empathize and a sophisticated theory of mind. She cites, among other evidence, the animal’s ability to distinguish between numbers up to five and a familiarity with transitive inference — the idea in logic that, if A is greater than B, and B is greater than C, then A is greater than C.
In the chicken’s case, this has been shown to manifest itself in the time-saving skill of determining that if Henrietta the chicken has already beaten you up, and Henrietta has herself lost a fight to Barbara, then there is no point in challenging Barbara for access to the grain bowl. Actually, in the area of mathematical reasoning at least, science is only now catching up with what Las Vegas has known for years. Ginger the chicken, who roamed The Strip in the early part of this century, has been described as a “chicken extraordinaire” (as opposed to chicken supreme). Certainly for casinos the title was merited by her revenue-earning abilities alone, because Ginger could play tic tac toe and, when allowed to go first, consistently won — as much as $10,000 a pop. Admittedly, going first is a significant advantage in the game but, then again, so is not being a chicken. So it is that chickens’ surprisingly sophisticated language gives a clue to their understanding of the world. They can give alarm calls when predators are nearby, and moderate those calls based on the size of their chicks. They can display distressed vocalizations when their chick is attacked by puffs of air (one of the more esoteric experiments cited). Cockerels, meanwhile, offer up more courtship vocalizations when presented with a hen, rather than another cockerel. The report was welcomed within the chicken cognition community. Siobhan Abeyesinghe this year published a seminal study Do Hens Have Friends? (Its conclusion: no). “Chickens certainly have more capabilities than people are aware of,” she said. “I do think they are unjustly maligned. It suits us to do so because we have something invested in farming them in large numbers. We have this psychological shielding to devalue animals we use for meat so we feel less concern about them. This entry was posted in Chickens, Health, News and tagged Animal welfare, Bird intelligence, Bristol University, chicken, Friends, Las Vegas, Theory of mind, Thomas Nagel on June 20, 2013 by naturalpfg. Hens are capable of mathematical reasoning and logic, including numeracy, self-control and even basic structural engineering, following research. Traits such as these are normally only shown in children above the age of four, but the domesticated birds have an ability to empathise, a sophisticated theory of mind and plan ahead. “The domesticated chicken is something of a phenomenon,” Christine Nicol, professor of animal welfare at Bristol University, and the head of a study sponsored by the Happy Egg Company. In her study ‘The Intelligent Hen’, Ms Nicol explains the animal is capable of distinguishing numbers up to five and is familiar with transitive inference – the idea in logic that, if A is greater than B, and B is greater than C, then A is greater than C.
For a chicken, this could be applied to fighting. If the first chicken beat the second, who had already beaten the third, the third chicken would assume that the first chicken would beat them too. The birds also have an understanding of physics, which was shown in experiments where they showed more interest in realistic diagrams than those that defied the laws of physics. Young chicks knew that an object that moves out of their sight still exists, unlike human babies who only develop those skills aged one. Chickens also showed the ability to plan ahead and exhibit self-control, with 93% of hens understanding that if they waited longer to start eating food, they would be allowed access to it for longer. Further evidence of hens’ intelligence comes from tests showing that at just two weeks’ old, they can navigate using the sun by taking into account its height and position during the day. Siobhan Abeyesinghe, who this year published a seminal study Do Hens Have Friends?, told the newspaper: “Chickens certainly have more capabilities than people are aware of. I do think they are unjustly maligned. This entry was posted in Chickens, News and tagged Animal welfare, Bristol University, chicken, Christine Nicol, Happy Egg Company, Logic, Theory of mind, Times on June 19, 2013 by naturalpfg. A free buying guide that takes the guesswork out of finding alternatives to factory farming. Have you ever looked at a food label and thought, “Sounds good, but I have no idea what this means?” You’re not alone! With so many food choices and claims out there, it’s hard to know where to get real information. What do Cage Free, Free Range, Natural, and Organic even mean? Is there a difference? Our food choices have a huge impact on the world. People are purchasing food with increasing concern for ethical and social issues. Consumers are demanding more locally, humanely, and sustainably-produced animal products and plant-based alternatives. That’s where BuyingPoultry.com comes in! For the past four years, we’ve been working with high-welfare poultry farmers and animal welfare experts to create BuyingPoultry.com—a free buying guide that takes the guesswork out of choosing the most humane and sustainable poultry products and plant-based alternatives. Buying Poultry will list every poultry producer and poultry certification in the United Sates and also tell you how they treat their animals, their employees, and the environment. With BuyingPoultry.com, you’ll be able to see who’s best and who’s worst in the U.S. and in your local grocery store. We’ll list what each company can do better and make it easy for you to add your voice to the cause. We’ll also give you information about the best plant-based alternatives and where you can find them. Best of all, it’ll be FREE and easy to access on your computer, smartphone, or tablet. Seems like a great idea, right? We think so too. But creating a free tool that is comprehensive, authoritative, and functional isn’t as easy as it sounds. We have an amazing team of animal welfare experts and digital ninjas assembled to make Buying Poultry a reality. Now all we need is your support! This entry was posted in Chickens, Feeding, Free range, Health, Housing, News and tagged Animal welfare, Food, Free range, Free-range eggs, Organic certification, poultry, Poultry farming, United States on June 4, 2013 by naturalpfg. In 2009 Home4Hens was founded by Kathryn and Michael Vogelenzang in Dumfries and Galloways to become the first chicken rescue and rehoming organisation in Scotland. Their mandate was simple, to give commercial laying hens a future after farming. Their aim, to help to provide a free-range retirement for ex-laying hens otherwise destined for slaughter. Home4Hense buy ‘commercially spent’ hens from UK farmers who support the work of the charity. The girls are treated to a health check up, ensuring their best care and attention before releasing them to loving homes. If you choose to re-home a few hens from Home4Hens we’re sure you will find it as rewarding an experience as we do. Not only are you providing commercial chickens with a well earned retirement and saving them from slaughter but they also reward you with great eggs and great entertainment. This entry was posted in Chickens, Feeding, Free range, Health, Housing, News and tagged Animal welfare, Battery cage, chicken, Dumfries, Farming, Free range, Pet adoption, Scotland on June 3, 2013 by naturalpfg. With over a month left until the start of the 2013 Tour de France, Davis residents looking to get their fix of a tour de something are in luck — the fourth annual Tour de Cluck will take place on May 25. The two main components to Tour de Cluck include the Art Auction and Exhibit and the Bicycle Chicken Coop Crawl, although additional events are ongoing throughout the month of May, according to Neil Ruud, Tour de Cluck event coordinator. The proceeds from the art auction will go to the Davis Art Center, which offers support to local artists, sponsors art-related events and maintains a close relationship with the local arts community in Davis, Ruud said. Tickets for the event are sold out. Seven hundred people are expected to attend the coop crawl, according to Gilbride, and 17 coops are being showcased. Davis Farm to School works directly with the Davis Joint Unified School District (DJUSD) to support these goals on a local level. According to Gilbride, the expansion of the event, the theme of which is “growing, crowing and cycling things,” reflects this multifaceted community identity. This is the first year the Davis Art Center is involved in the event, in part because of event founder Jake Clemens, who felt that more local organizations could benefit from such a large event. The event, according to Ruud, embodies the sustainable lifestyle that is possible in Davis. According to Gilbride, the art center will act as a “roost stop” during the coop crawl where people can stop and relax, but the center serves the community in other ways beyond this event. Collecting eggs in one’s own backyard is about as local as one can get in regard to fowl-related food. Ruud said not only do backyard chickens allow people to collect their own eggs, but between the time the chicken stops laying eggs and before it has died, many will opt to eat the chicken as well. Others may choose to give them away. According to the website, eggs from backyard chickens are more nutritious than those bought in stores, containing higher levels of vitamin A, vitamin E and beta-carotene. Chickens also provide a less synthetic method of controlling pests and providing fertilizer. “Roosters, however, are illegal within city limits,” Ruud said. According to Ruud, the bicycling element of the route incorporates another aspect of sustainability in Davis that the event emphasizes beyond sustainable food: sustainable transport. The route, which is approximately 15 miles, is self-guided, although participants are provided with a map to explore the various coops at their leisure. The event coordinators take great care to ensure there is no cross-contamination from coop-to-coop. Participants are not allowed to touch the chickens or enter the coops, but according to Ruud, cross-contamination can occur simply from walking through the backyard if there is particulate matter present. Other measures taken during the event, according to a Tour de Cluck document titled “Chicken Health and Safety,” include spray bottles of disinfectant at each coop for visitors to clean the bottom of their shoes, as recommended by the American Poultry Association (APA). Hand sanitizer will also be provided at each coop, and the document suggests that those with free-range chickens may want to isolate their birds in an enclosure for several days prior to the event and hose down the yard to reduce particulate matter. Other Tour de Cluck events include the Fowl Food Frolic, during which some local businesses such as the Davis Graduate and Dos Coyotes will be offering signature Tour de Cluck dishes benefiting Farm to Fork. The Frolic lasts through May 25. Any customer who orders a Fowl Food Frolic dish will also receive a free raffle ticket for the Fowl Food Finale at Sutter Davis Hospital on June 1, during which various prizes will be raffled off, ranging from wine to pet supplies. Ongoing Tour de Cluck events include Chicken Skool, free talks about various topics related to backyard chicken keeping, and Community Crowers on the Green, during which local nonprofits such as Cool Davis and the Center for Animal Welfare — based out of the UC Davis Animal Science Department — will be at Central Park during the event to answer questions. This entry was posted in Chickens, News and tagged American Poultry Association, Animal welfare, Art Auction, backyard chickens, Central Park, chicken, Davis, Davis Joint Unified School District on May 24, 2013 by naturalpfg. A recent scientific study has shown that pre-stun shocks in commercial broiler processing significantly affect carcase and meat quality as well as bird welfare. Research undertaken by the University of Bristol studied the incidence and effect of pre-stun shocks in a commercial broiler processing plant using an electrical waterbath stunning system, the most commonly used system in the UK. The study identified a significant level of pre-stun shocks, particularly in lighter, more active birds, correlated with a significant level of adverse effect on carcase and meat quality. Pre-stun shocks were also seen to be a contributor to the incidence of mis-stuns (by causing birds to ‘fly’ the waterbath). The results of the study indicate not only a serious welfare problem but also a significant financial burden for producers of broiler chickens stunned using the electrical waterbath. This entry was posted in Chickens, Free range, Health, News and tagged Animal rights, Animal welfare, Bird, Broiler, chicken, Regulation, Royal Society for the Prevention of Cruelty to Animals, University of Bristol on May 13, 2013 by naturalpfg. If you’re looking to rehome ex battery hens or ex-commercial hens – including barn hens and commercially free ranging hens – then the Hen Rehoming Hub is here to help! They provide a free mapping service of the UK, that lets you find your closest hen rehoming organisation, bringing you the latest rescue dates and collection locations. 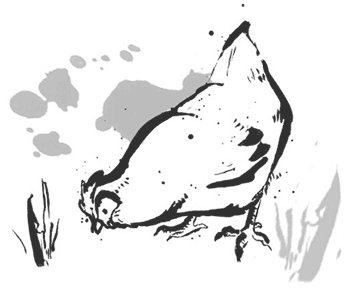 Simply enter your post code or nearest town and select ‘Find Chickens!’ into the map on the main page. The Hen Rehoming Hub will return the latest rescues happening closest to you. Select a hen icon to find out more, and follow the links to start the ex battery hen rehome and adoption process with the relevant rehoming organisation. The ‘i’ information icon denotes commercial hen rehoming organisation headquarters, who deal with enquiries and may also operate rescues. Please note all hens rehomed via organisations listed on this site are meant for pet homes with a ‘no cull’ policy. This entry was posted in Chickens, Free range, Health, Housing, News and tagged Animal shelter, Animal welfare, Battery cage, Organization, Pet, Pet adoption, Rescues and Shelters on April 22, 2013 by naturalpfg.